Every Field in the table is made up of what is called a Data Element, which defines specific attributes of each field. The first Field to be created here is an important one within an SAP system, and identifies the client which the records are associated with. In the Field name, enter 'Client', and in the Data Element, type 'MANDT'. This Data Element already exists in the system, and after entering it, the system automatically fills in the Data Type, the Length, Number of Decimals and Short text for the Data Element itself. Ensure that the 'Client' field is made a Key field in the table by checking the 'Key' box. The next field will be called 'Employee'. 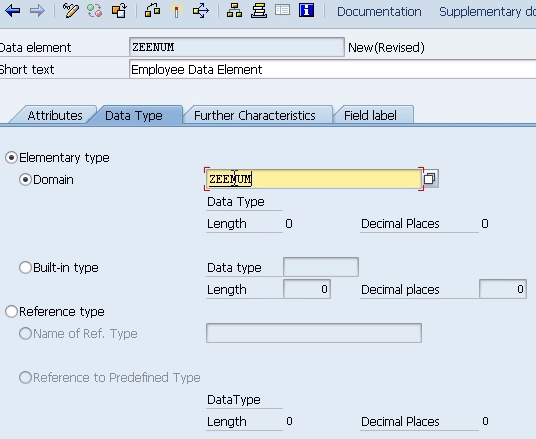 Again, check the box to make this a Key field, and enter the new Data Element 'ZEENUM' (Data Elements broadly must adhere to the customer name space by beginning with Z or Y). Once this is done, click the save button. 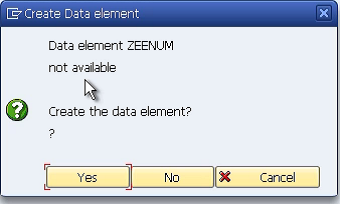 Until the Data Element 'ZEENUM' is created, it cannot be used within the system. To do this, forward navigation is used. Double-click the new Data Element, and a window labelled 'Create Data element' appears. Answer 'Yes' to this, and the 'Maintain Data Element' window comes up.